උතුරේ යාපනය දිස්ත්‍රික්කයට එක්සත් ජාතික පක්ෂයෙන් තරග කරන විජයකලා මහේෂ්වරන් මහත්මිය ඇතුළු එජාප අපේක්ෂකයින් තම මැතිවරණ ව්‍යාපාරය ප්‍රවර්ධනය කිරීම සඳහා ඊළාම් සිතියම යොදා ගෙන ඇත. මොවුන් ශ්‍රීලංකා සිතියම විකෘති කරමින් ඊලාම් නියෝජිතයින් ලෙස මැතිවරණයට සහභාගී වනබව ඔවුන්ගේ මැතිවරන ප්‍රචාරක කටයුතුවලින් පෙන්නුම් කෙරේ. අගමැති රනිල් වික්‍රමසිංහ මහතාගේ ඡායාරූපය ද මෙම ඊළාම් සිතියම සමඟ ප්‍රදර්ශණය කොට තිබේ. එක්සත් ජාතික පක්ෂය මේ වනතුරු මේ සම්බන්ධයෙන් තවමත් ප්‍රකාශයක් නිකුත් කොට නැත. පැරණි සිංහලේ කොඩිය ප්‍රදර්ශනය කලැයි පසුගියදා පුද්ගලයෙකු අත්අඩංගුවට ගත් අතර එය ජාතික කොඩිය විකෘති කිරීමක් ලෙස පොලිසිය අර්ථ දැක්වීය. ඒහෙත් ශ්‍රී ලංකා සිතියම විකෘති කිරීම පිළිබඳ මේ වන තුරු පියවරක් ගෙන නොමැත. This is YAMA PAACHANAYA indeed. Catholic traitor chief ponil w is ready to sell the country to get into power. Get to power at any cost. Sell his country to eelamists and mussies. Eelamists say they had kingdoms in Sri Lanka. Those kingdoms exist only in www. and books. Nobody has ever seen any evidence to this day. No ancient buildings etc. So they are mythical kingdoms indeed. Catholic traitor chief ponil did the biggest robbery in the history of the country adding another feather to his treacherous cap. Traitors Northern Alliance (TNA) and Sri Lanka Multiplying Community (SLMC) mussies. UNPatriotic party supporting Sinhalese (Asinhalese) are overjoyed by batalande butcher’s actions! chief’s. Even the nidhan hora (alugosu premadasa’s son). These traitors know Sinhalese easily fooled. Why not raise right hand all the time. Asinhalese can’t wait to vote! BATALANDA RANIL AND SOMARAMA SIRA WILL SEE WHEN THESE BUGGERS ARE ONLY AT THEIR DOORSTEP. IT WONT BE LONG. The current scenario reminds us 80’s90’s and 2000 under UNP dictatorship rule. People shouldn’t take it lightly.Already terror has started in Colombo and other areas.TNA is demanding self rule,Muslims are demanding another thing and for all that UNP traitors has promised that if they come to power they will happily give in to their demands. So do you need a Govt who will break the island or a Govt who will keep it in one piece and rule and serve all alike? UNP traitors are working to satisfy International community. 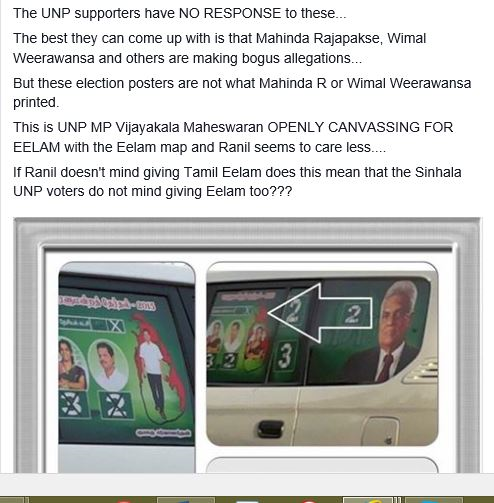 They are here in droves.They advise,Dictate and Finance the UNP election machine. Champaka,Rajithya,TNA,Muslims are all in their payroll. We should defeat these anti Sinhalese,Anti Buddhist gang of traitors at all cost. They treat Maha Sanga like elephant dung arresting,Intimidating and harassing. If the power goes to these Christian rulers the country will be like in Gaza.Enclaves rule by different rulers and different races. 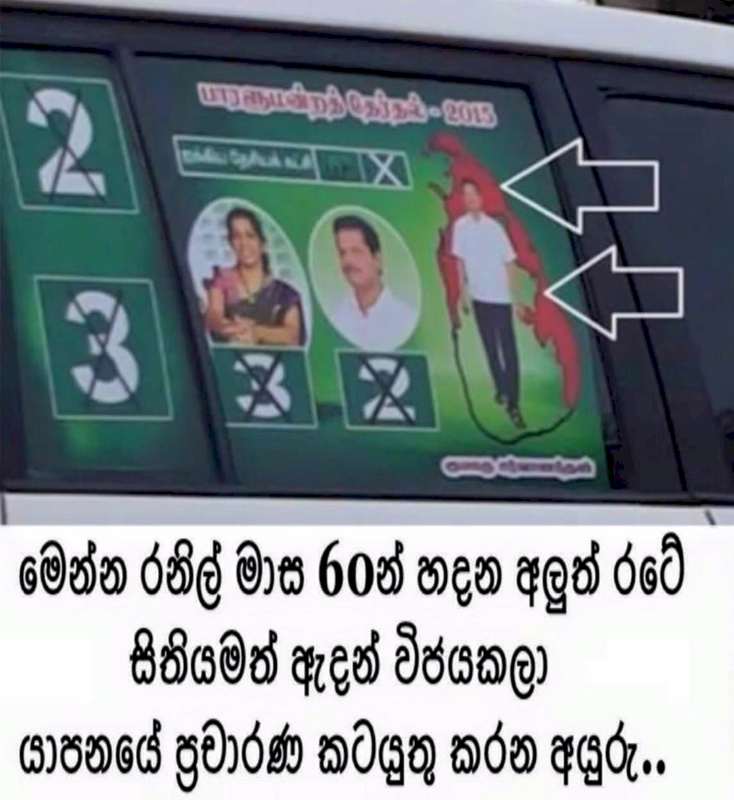 Think what will be like if UNP takes over the country and decide intelligently. Vote to the BETEL and Rajapksa if you need a peaceful country to live with your children in the future. This entry was posted on Saturday, August 1st, 2015. You can follow any responses to this entry through the RSS 2.0 feed. You can skip to the end and leave a response.